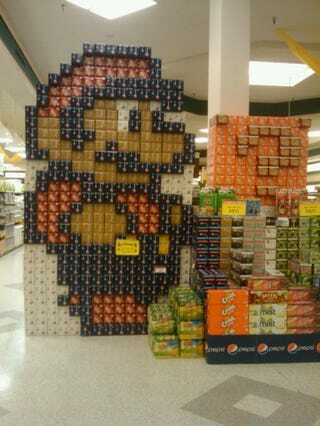 One August ago, we showed you a Mario made of boxes of Pepsi soda cans. One year later, we are showing you Super Mario Made Of Soda Can Boxes 2. 2010 edition is up top. 2009 edition is here, first posted on Kotaku in August 2009. Mininmal graphical improvement. Not really a generational leap. A little pixelated, but thankfully not much flicker.